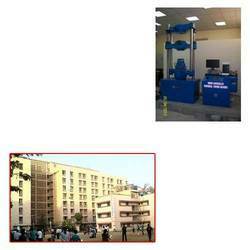 Our range of products include universal testing machine for engineering institute. Backed by a team of skilled professionals we are offering our clients a wide range of Universal Testing Machine for Engineering Institute. This machine is made using high grade factor inputs and sophisticated machinery under the supervision of experts as per the international standards. The offered machine is used for testing tension, compression of metallic materials. We also provide our customers this machine within committed time frame. Looking for Universal Testing Machine for Engineering Institute ?